First of all, Happy Easter! This will be a long weekend of vacation, so better keep some automated trading rules running these days. Crypto markets never sleep, but you all need some good rest sometimes. With our automated trading strategies on you can catch any opportunity 24/7 with coinrule! Bitcoin looks still quite solid, considering the limited retracement experienced on the original price pump. 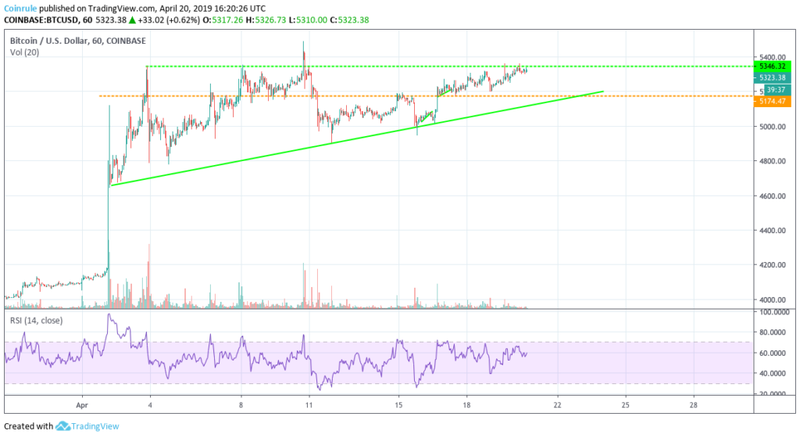 At the moment no worrying signs of a sharp pullback yet and when BTC volatility is low, we all know that Altcoins can provide huge gain opportunities at any time. What I like the most of these recent times in the crypto space is that pessimistic news happens to be released less often and the most significant market moves happen now on good news, sometimes even when this news was somehow expected. This is a meaningful sign of the shift in current market conditions. 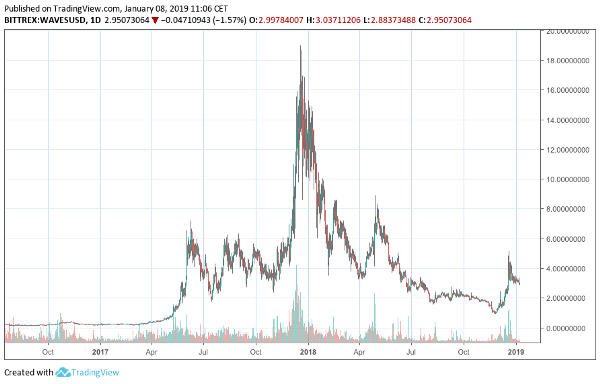 not all altcoins are the same and probably when a new “altseason” will come, not all will skyrocket in the same way. Overall, more or less, all should gain from a changed overall mindset in the market, but our primary goal is to optimize our returns, so we shouldn’t feel satisfied if our bag of altcoins returns, let’s say the 50%, if some other coins in the same time period returned 200%. Remember that if some of your coins return 3-4x, you could take profit and reinvest in other cryptocurrencies that are at an earlier stage of the market cycle. The most important rule, in that case, is to have in place a stop loss (or in this case, a trailing stop) so at least a minimum level of gains will be guaranteed. But we will talk about it (hopefully!) in the next episodes! For now, how we should choose the coins to buy? The first option is to stick with those projects you know and DYOR. Doing-Your-Own-Research is always a reasonable approach since many opinions you will find on Twitter, Reddit or other communities often are made up only will the ultimate goal to pump some shitcoin. Second, look at the charts and analyzing the prices you will always find all the relevant info about the state of a coin. I am a firm believer in price action, the chart of a coin incorporates most of the things you should know about the dynamics of demand and supply, which ultimately are the main drivers of the price. 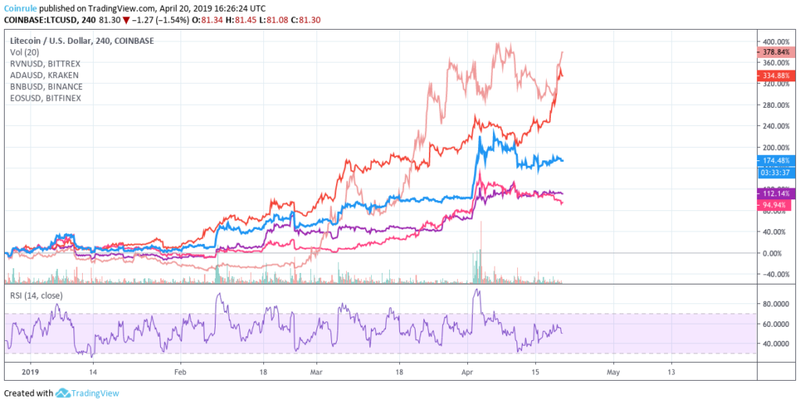 I am looking at many charts these days, and I would say that some have been already on the move for months: Ravencoin and Binance returned more than 300% since the beginning of the year, also Litecoin, Cardano and Eos posted great performances. So they will likely keep performing well, but if you are looking for better risk/reward trades, probably you need to look at charts with different patterns. 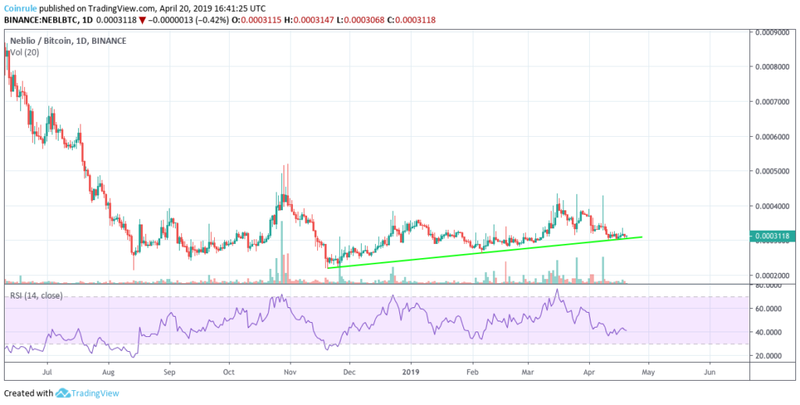 What I am looking for from the altcoins I want to accumulate in the next weeks are solid support areas and mid-to-low capitalizations that can potentially bear a more considerable margin of growth. 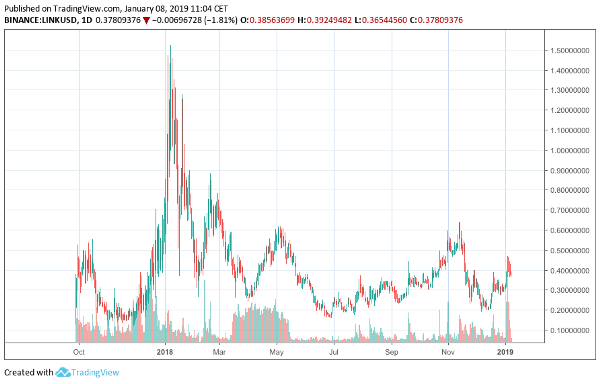 Here is my tip: if you look at the chart of the Total Altcoin market capitalization, excluding Bitcoin, you will see that since the low we had in December 2018 (a price divergence can be spotted on the lows, btw), the following local lows are sequentially higher, this underlines a good buy pressure that should provide excellent support in case of future headwinds. 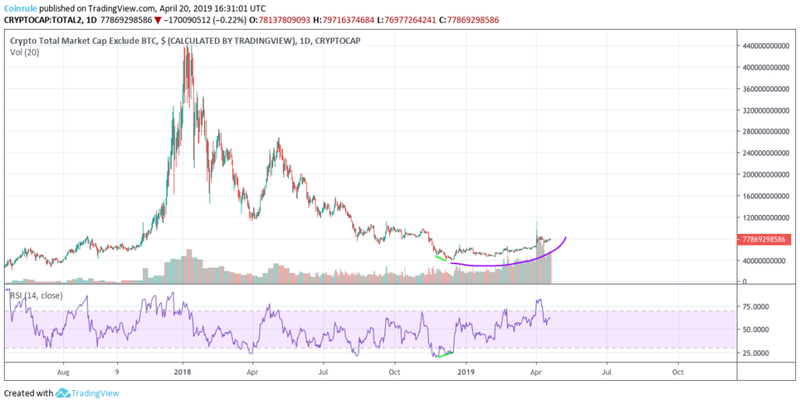 The RSI also confirms the healthy and sustainable uptrend. So this the pattern I want to see in the altcoins in my bag for the coming months. 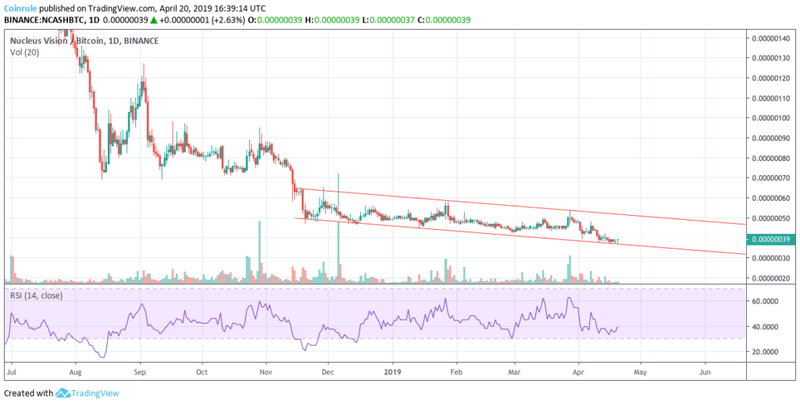 To give you an example, look at Ncash. The series of lower lows from December is not technically a good indicator. Does that mean that the project doesn’t have future potentials? NO! just that as of now the market prefers other projects. Like it or not, the market is always right! 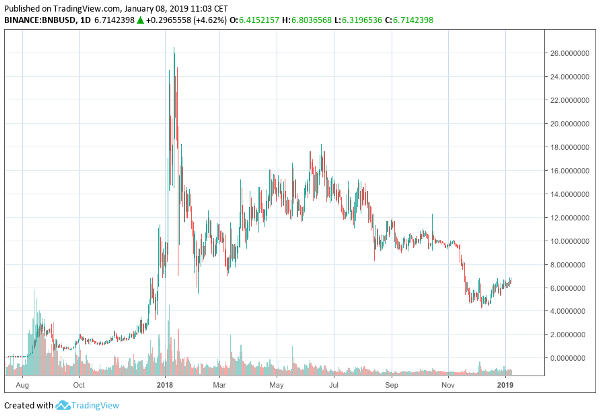 A project that the market seems to appreciate more is Neblio, here the series of higher lows follow better the pattern that overall the altcoin market is experiencing. In this way, you can take advantage of price dips on your selected Altcoins to buy without FOMO. Create now your automated trading strategy in a minute! Follow us on Twitter for more market views and trade ideas. Please note that none of the above is investment advice. Trading and holding cryptocurrencies remain a high-risk investment that is only advisable to users who are willing to spend time doing their own research. The year that just ended turned out to be very tumultuous for all those that invested in cryptocurrencies as most of the assets experienced losses between 80 to 95% from their all-time highs. That was a harsh lesson for newbie investors looking for easy gains, forcing a high number of them to leave the market as they were not able to carry any further losses. However, what happened to the cryptocurrencies’ parabolic rise and fall in 2018 is no different to what many other assets in financial markets previously experienced: a rapid price appreciation, inflating a bubble, which when it bursts, has effects on all the companies involved. In times of price depression, great opportunities arise for those that can select those projects with better potential and more solid value proposition. What follows is my selection of cryptocurrency tokens and coins that I see to have the potentials to be very successful in 2019. Binance is unquestionably the number one crypto exchange in the World according to many metrics. Apart from recording the highest traded volume (30 days volume according to Coinmarketcap), Binance is positioned as one of the most innovative and transparent ventures in the crypto-space. Their goal is not only to act as an exchange for tokens and coins but to become a real catalyst for the development of the cryptocurrency and blockchain industry and work for its global adoption. The creation of Binance Labs designed to fund and support new startups, Binance Academy promoting an in-depth knowledge of Blockchain technology, Binance Research providing high-quality analysis and reports and Binance Charity Foundation are all side-projects but will contribute to a significant strategic advantage against competitors as wider adoption of cryptocurrencies continues. In early 2019, Binance will be the first “centralized” exchange to switch its operation to a fully decentralized system, featuring high-performance trade execution made possible by a 1-second transaction confirmation time. The BNB token has played a central part in the success of the company (incentivizing competitions and encouraging the holding of the tokens to obtain discounts on transaction fees) with a very solid tokenomics and it will soon play an even more relevant role in the operations of the exchange. One of the biggest challenges for Cryptocurrencies and, in general for Blockchain technology, is the lack of everyday application in real-world use cases and the currently minimal connection between the “real” and the “crypto” world. Among the projects most likely to solve this soon is Chainlink, which is a “smart-contract oracle” for decentralized applications. An oracle is a data validator that checks whether data entered into a Blockchain is correct. Blockchains alone can only validate data that is already “on-chain”, meaning events that have happened on the Blockchain. This is, in turn, a significant drag on the implementation of new features and developments linking Blockchains to real-world use cases. Simply put, the value proposition of many smart contracts based Blockchains is to radically improve the efficiency in establishing agreements between two or more companies thanks to the tamper-proof nature of Blockchains. In reality, this currently often fails because companies operate in the “real world” and most agreements involve ‘off-chain’ data such as money transfers (e.g., through the SEPA system), product production data, deliveries of physical goods, inflation data, and so on. In contrast to ‘on-chain’ data, such ‘off-chain’ data is not tamper-proof and could be manipulated, thus undermining Blockchain’s central value proposition. To address this, Blockchains need some sort of third-party data feed (the oracle) to import external data and trigger smart contract executions. Chainlink allows decentralized applications, also known as dApps, to interact with “real-world” data and run transactions through third-party APIs. Chainlink solves the problem thanks to API connections to all the data with which decentralized applications interact via the Chainlink Smart Contracts, finally opening the possibility of developing hybrid systems of Blockchain-based architectures actively interacting with events happening in the “real world”. But there is even more to add on the potential of Chainlink. The project aims not only to connect Blockchains to the real world but it will also provide an interoperability solution for the crypto world, ‘linking’ different blockchains to each other that otherwise wouldn’t be able to interact with one another. To give an example, just imagine the benefits for all of the crypto industry if the Ethereum and Bitcoin chains could exchange data with one another in a safe, secure and decentralized way. The Chainlink mainnet was expected to be launched in late 2018, and a big announcement is expected soon about the new launch date. When this big step is undertaken, it will provide additional value and will attract more investors. 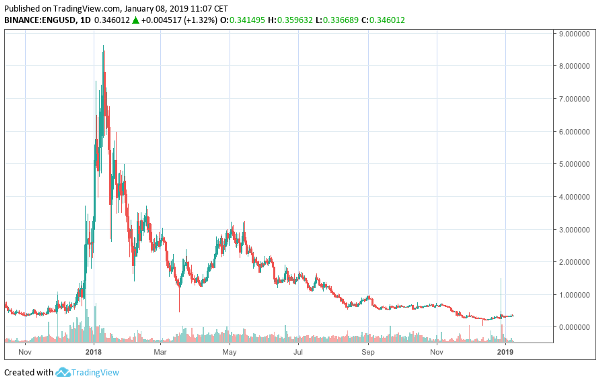 To be noted, the price of the token posted a tremendous performance in the recent months, marking new all-time highs in BTC terms, something that is not easy to be found during a Bear Market. Furthermore, the company has a long history of establishing partnerships with solid API providers and very likely, this trend will continue to increase the number of possible future use cases. Another broad critique for Cryptocurrencies in 2018 has been the shortage of progress delivered by development teams. On the other hand, the Waves team raised $16 mln in 2016 (long before the 2017 Great ICO-Hype) and successfully delivered a fully working a decentralized exchange in 2017 and kept adding features since then. Other than a DEX with multiple crypto and FIAT gateways, Waves is a fast and scalable Blockchain allowing cheap transactions, permitting a smooth deployment of personalized tokens in a matter of minutes, an efficient staking system based on hundreds of Nodes and tens of Pools, Multi-sig wallets and recently introduced Smart Accounts and Smart Assets onto its Mainnet. Especially the activation of Smart Assets is significant as they feature scripts that will make asset freezing possible, allow whitelisting/blacklisting specific addresses to implement controls and restrictions to the asset transfers, taxation and controlling asset pairs so that tokens will be traded only against selected currencies. While a lot of this goes against the core ethos of decentralized and censorship-resistant public blockchains, Waves positioning is aimed at Business use-cases that require full and out-of-the-box regulatory compliance. Waves positions itself as a comprehensive crypto-ecosystem backed by a structured and skilled company behind it. Everything in Waves is manageable through a Desktop App, Online Client, Mobile App, and a Chrome Extension, demonstrating a focus on user experience design that is rare in the current cryptocurrency world. The Waves team announced the launch of Tokenomica, a platform aiming to radically simplify the issuing of Security Tokens. This has been a “hot topic” lately and will be more and more important as players such as private companies, institutions and investments funds will finally have the tools they need to move to a real tokenization of their assets. The first important implication will be the opportunity of running a global Regulated Token Offer complying with local regulations and being able to apply all the necessary restrictions required to the asset. This will likely not only be a significant milestone for the Waves Roadmap but for the broad crypto ecosystem in general. Furthermore, Waves has secured a $120 mln funding round for the development of Vostok. Vostok will allow the creation of private permission-based Blockchains based on the fast and reliable Waves-NG protocol and will represent the perfect enterprise-oriented tool enabling companies to fully benefit from the security and privacy of Blockchain technology. According to the developing team, this new development will mark a significant step towards WEB 3.0, where new internet-based technologies will shape and enhance new forms of Businesses. Privacy has been a central theme since the beginning of the Blockchain Era. Nonetheless, few are the projects that can truly provide a real degree of secrecy for transactions. Leading “privacy” focused projects such as Monero, Zcash and Dash are still focused solely on transactions, meaning that their use-cases are limited. One of the main projects whose aim is to add a high degree of privacy to more complex computations (Smart Contracts) is Enigma. The development team claims to be “building Enigma to be the privacy layer for the decentralized Web”. More than ever in times like these, this looks like something that is an urgent need. The first more obvious application will be the deployment of agreements between parties combining the tamper-proof nature of Smart Contracts and the privacy protection offered by the Enigma protocol. Furthermore, Big Data companies analyze an enormous amount of information every second and most of that data could be considered very “sensible” and worth to be protected with a substantial degree of privacy. Some Business-cases should be required to add this privacy layer to their operations, namely companies dealing with pharmaceuticals and genomics, personal data, credit or more generally the Internet of Things. When Enigma fully deploys their Secret Smart Contract, decentralized applications will be enabled to handle sensitive data significantly reducing the risk of exposing sensitive data to nonauthorized parties. The full potential of this tool will be released in combination with Enigma’s Data Marketplace, which is already live and functional, where that data will be exchanged without risk of compromising its privacy. The development team stated that the delay in the deployment of the next Milestone on the Roadmap, Discovery, was caused by the fact that the partners were not ready to act as active nodes. The choice was made to prioritize long-term growth over short-term risks. This release is basically the MVP of Secret Contracts and will mark the full integration of Enigma with the Ethereum Mainnet. For sure this will be a game changer and will prove the real potential of the project. Additionally, another major stimulus could come from the partnership side. The company relies a lot on stable and reliable partners (the most notable being Intel) and new partners are expected to be added in the coming months. Holochain is one of those projects that are so visionary that it is almost impossible to describe them without forgetting to cite some (even crucial) aspect of their essence. We can summarize Holochain as a computing system that enables developers to build any kind of application without requiring any centralized organization. Those applications will run across a peer-to-peer network, whose nodes will be a wide range of devices, including any modern smartphone. It is important to note that Holochain is not based on Blockchain technology but is much more aligned with traditional peer-to-peer networks such as Tor. Unlike Blockchains which depend on finding a consensus between all nodes on the status of a ledger, Holochain is focused on finding a consensus on the infrastructure and DNA of any given application and then allows users to build this application based on that consensus. As such, Holochain is not data-centric but user-centric, taking a (decentralized) applications-first approach to the problem of ever greater centralization of the internet. One of the main differences between Holochain and any other crypto-related project lies in the philosophy that stands as its bedrock. Holochain defines itself as a “distributed” network more so than as a “decentralized” protocol for dApps such as Ethereum. While the difference may appear to be small, it is one of the main pillars of the project. Distributing the computational power across many nodes and letting them act as independent players in the system, Holochain aims to solve the scalability problems that affect Blockchain-based protocols. Just like in old-school peer-to-peer networks, the more applications will be developed on Holochain, the more nodes will have an incentive to participate, and the more computational power will be added to the network, making it faster and more secure. Another significant difference that distinguishes Holochain from other Blockchain projects is the rejection of consensus mechanisms such as Proof-of-Work or Proof-of-Stake in favor of a de-facto Proof-of-Service approach in which those users that complete tasks for other users get rewarded in Holo Fuel. Around this new “money”, the project expects to build a whole new value-oriented ecosystem and community. Once again, just like for other projects, the launch of the Mainnet will mark a crucial moment for Holochain’s development. However, probably more than for other projects, this will also represent an opportunity to demonstrate that the great idea that inspired the Holochain founding team is technically feasible. Perhaps this will come later this year, but in the meantime, the development team is expected to deliver other important milestones. One of the most important among them is the delivery of the first HoloPorts, specific pre-configured devices that will offer storage and processing power needed by the applications running on the network and which will grant Holo Fuel rewards to their owners. Some of the first applications that will be run will be HoloVault, HoloChat, Fractal Wiki and Errand which will help to grow the already vast and very active Holo Community. All the tokens I wrote about above can be traded on Binance, and using Coinrule you can enhance your trading experience to a more advanced level! Coinrule allows you to create trading rules that run automatically across your favorite exchanges. With Coinrule you can easily develop your own trading rules and strategies and set them up to run automatically. It is the “if-this-then-that” for cryptocurrency trading that allows you to plan your crypto trading rather than having to sit for hours in front of charts. Best of all? No coding skills are required, meaning anyone can use Coinrule. I am not an analyst or investment advisor. Everything that I provide here site is purely for guidance, informational and educational purposes. All information contained in my post should be independently verified and confirmed. I can’t be found accountable for any loss or damage whatsoever caused in reliance upon such information. Please be aware of the risks involved with trading cryptocurrencies. I own positions in the coins cited in the article as part of a broader diversified portfolio of crypto assets.